Starring Tom Hanks, Halle Berry, Jim Broadbent, Hugh Grant, Hugo Weaving, Jim Sturgess, Ben Wishaw, Xun Zhou and Susan Sarandon. Vyvyan Ayrs: What is a critic other than one who reads quickly, arrogantly but never wisely? I must be missing the deeper meaning in CLOUD ATLAS, a film so massive in scope that it required three of the most visually innovative directors working today to tackle it properly. I watched six separate stories span centuries and unfold in spectacular fashion before my eyes, and understood pretty early on into its gargantuan 164 minute running time, that all of these stories, although seemingly completely unrelated, were in fact all connected. I’m sure there has to be so much more symbolically going on underneath all the heavy handed imagery and crushing weight of all the prosthetics used in this film, but if there was, it never surfaced to the movie I was watching. 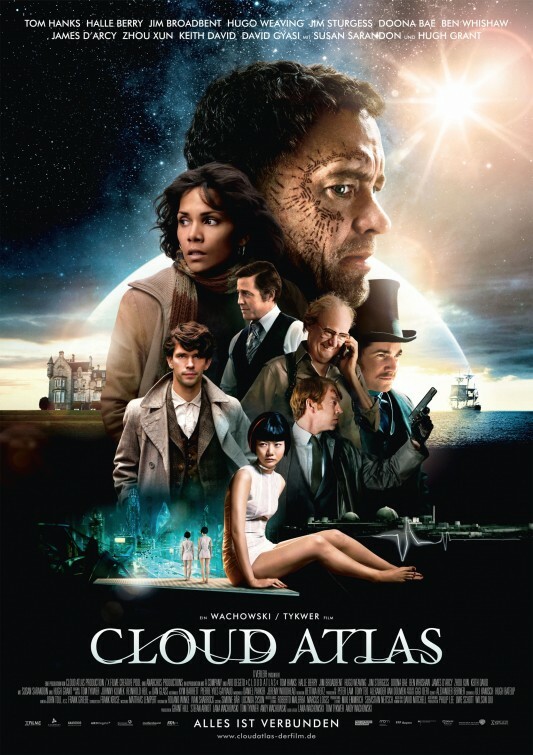 CLOUD ATLAS is surprisingly engaging, and at times extremely satisfying, but it insists you invest in it with every fiber of your being at all times, so it can also be exhausting to get through. And by the time I reached the end of this epic journey, I did not find the revelations to be all that worth the effort. Where to begin when talking about a story that is meant to demonstrate that all stories are connected throughout time? Honestly, I don’t know and thinking about it is making my head hurt. This is my job though so I must attempt this, no matter how convoluted the directorial team, made up of the Wachowski siblings and Tom Tykwer, try to make it for me. A man (Jim Sturgess) takes a stand against slavery and is unknowingly poisoned while on a ship at sea, circa 1850. Another man (Ben Wishaw) writes a sextet that no one will ever hear in 1931. A woman (Halle Berry) tries to take down a nuclear company up to no good in the 70’s. An older gentlemen (Jim Broadbent, the film’s shining star) is tricked into a nursing home prematurely in present day. A genetically engineered woman, known as a fabricant (Xun Zhou), serves food and wonders if there is anything more to life in a dystopian near future (in what I found to be the most compelling of the stories). And finally an old man (Tom Hanks) tells a campfire story in the far away future about when he was young and what it was like to live just after humanity fell. All of this is tied together by the suggestion that each of these stories contains a character that once lived in another time, in another one of these stories. From what I hear, the book which CLOUD ATLAS was based upon, written by David Mitchell, is even more dense. From what I hear, it also does a better job at showing how cyclical all of our history and connectedness truly is. Having not read it, I cannot confirm this, but a novel does provide a better foundation with which to base this elaborate and ambitious undertaking. 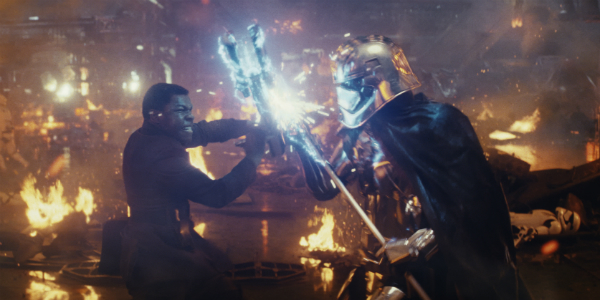 The visual adaptation here is more a spectacle than an emotional or meaningful exchange. Even the interconnectedness of it all has to be spelled out to us by having all the actors play several different parts (with varied results). While the three directors are all on the same page visually, seamlessly jumping back and forth between the Wachowski’s future and Tykwer’s past and present, they are all amiss when it comes to tying together the actual feelings that humanize us all throughout time. 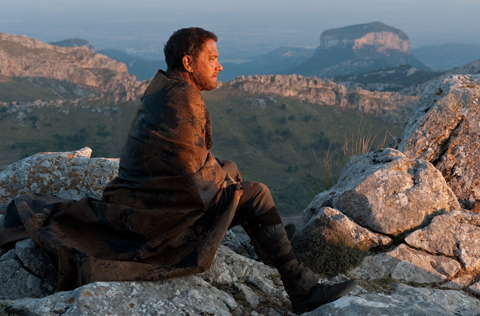 When they are in the moment, they often get it right, but CLOUD ATLAS, isn’t about just one moment; it is about them all and this is just too big a picture to behold all at once. I'm sorry but if Cloud Atlas "fell flat" for you, I suspect it was because you didn't fully understand it. In fact, you opened your review by stating, "I must be missing the deeper meaning..." You hit the nail on the head. You also stated, "it insists you invest in it with every fiber of your being at all times" -- isn't that the point of cinema? Why go and see a movie if you aren't willing to immerse yourself in the story at hand? I presume you had no prior knowledge of David Mitchell's novel. Considering how the original book was written, the film was assembled quite masterfully. It's a shame the general public (yourself included) just didn't understand this incredible film. Thanks for your comment. I've actually already had this conversation with someone else today oddly enough. When I said, "I must be missing the deeper meaning," I say so with a slight level of sarcasm. The fact is that reading the novel which a film is based upon is not mandatory to see the film. It must surely enhance the experience that is Cloud Atlas but I just didn't feel that the film did a good enough job making its point. As for the level of involvement, I finish that point by saying for all it demands of the audience, I didn't feel the film rewarded accordingly. I'm not suggesting an unwillingness to invest but rather that I didn't feel it worth it in this case. Just because people don't like a movie does not mean they didn't get the movie. It is a bit insulting to my intelligence, and the intelligence of the general public, which apparently you consider yourself separate from in this instance, to suggest that I'm just not bright enough to get this film. It didn't confuse me; it just didn't satisfy me. I'm glad you liked the film. I'm glad that your prior knowledge of the novel enhances your experience of Cloud Atlas. You liked it, I only half-liked it. Why can't we just leave it at that? Is there really a need to call a lot of people stupid to justify your enjoyment of a film? What I Simply would like to' say is that , it is not so important to understand, even because different layers of meaning are probably there, I have appreciated your review and agree on the fact that the movie works and almost three hours just serm like an epusode of a tv series. Great movie in my humble opinion. I look forward to see The original language version as I have seen it in my country Italy , well adapred, but it obviously looses pathos .